Once upon a time, a long time ago, there was a great nothing, a time called Te Kore. Into this time there came an itch, Io, the life force that created Sky father, Rangi, and Earth mother, Papatuanuku. Rangi and Papa were so in love that they lay close to each other, allowing no light into the time of Te Po (the night). Their children were not happy with living in darkness, so their son Tane (God of the forest) stretched skyward, pushing his father away from his mother. Rangi was so sad at this separation that he cried (toto), forming the island we know of as Rangitoto. Tawhirimatea (God of the winds), another of their sons was furious at Tane for separating his parents, so angry that he threw his eyes to the skies…. 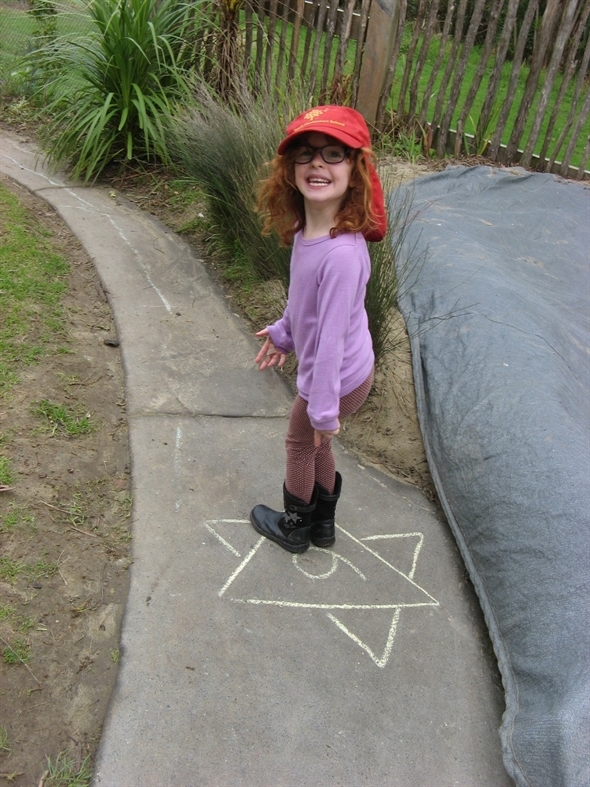 forming the star constellation of Matariki (eyes of the God). The arrival of Matariki back into the winter skies marked the beginning of the new year for Maori. A special period to celebrate with whanau, to remember those gone before us, to harvest and to plan for the future. It was believed that the brighter and clearer the stars, the more bountiful the year ahead would be. 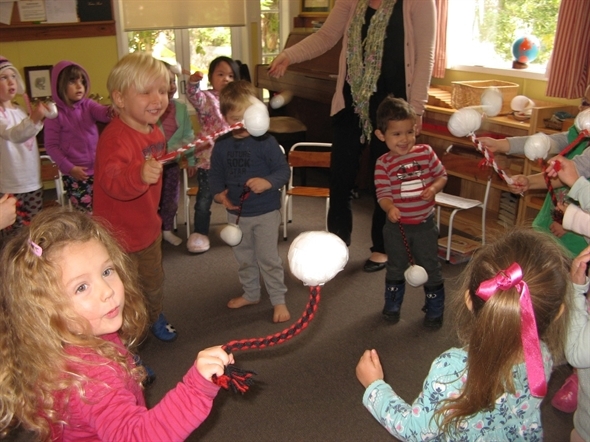 We have all enjoyed exploring this constellation through arts, which we have focused around the Maori matariki value of Manaakitanga (Kindness and care of ourselves, others and our environment). 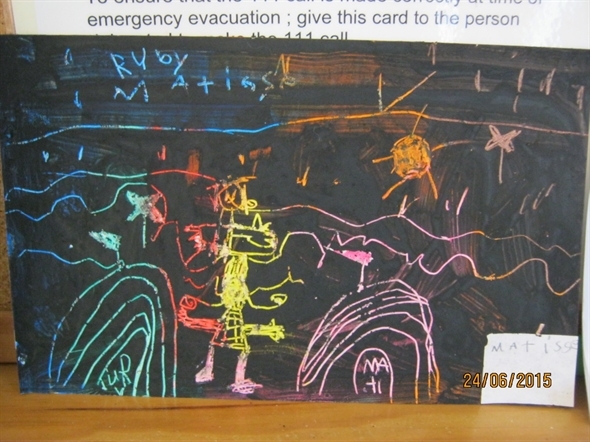 We have used only recycled card for our art works, discussing how we can reuse to reduce waste to our world. 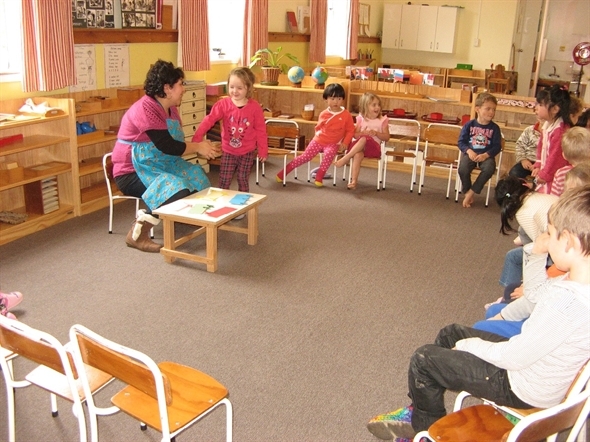 Inside too, we have been learning our Maori colours and numbers, and have had stories told of how the Maori celebrated this time in days gone by. 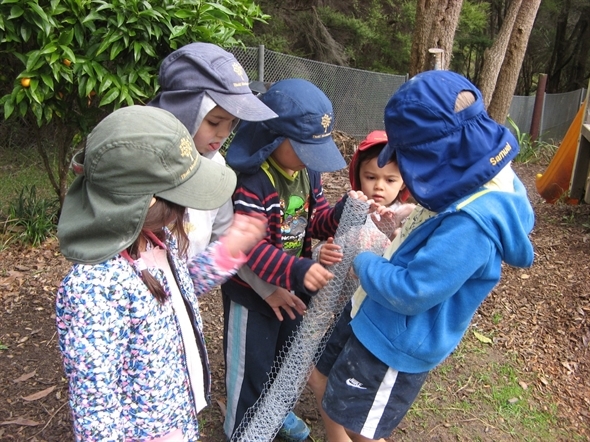 Connecting our outdoors to indoor learning is always important. 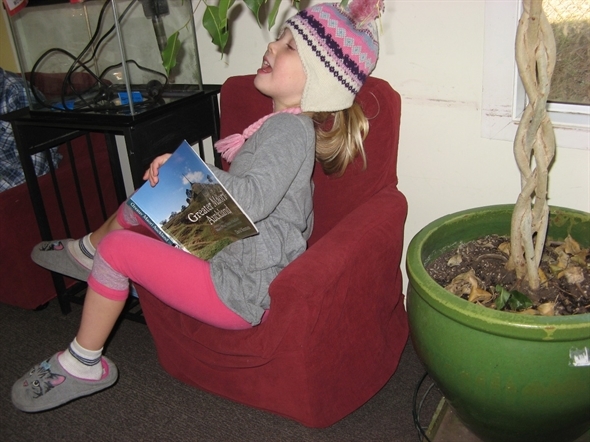 The children have enjoyed the new materials on the te reo Maori shelf, that incorporate photos to names of places that are important to them outside. And no Matariki would be complete without waiata (song) and kapa haka (ceremonial dance). Looking at these bright stars, it is clear to me the future will be full of Manaakitanga. We will continue to enjoy this special time together as te whanau o Titoki (the family of Titoki) and look forward to welcoming you all to our Matariki end of term feast next Friday. 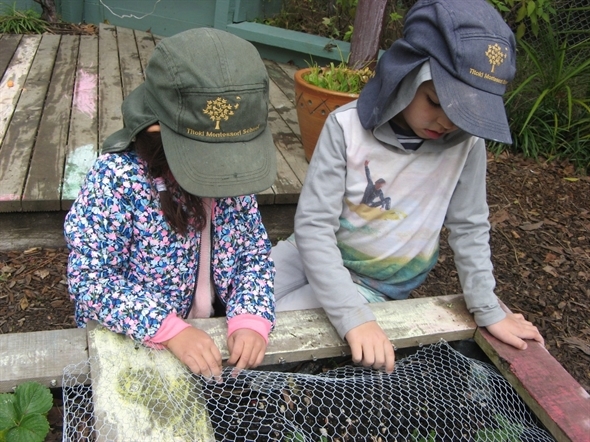 By celebrating Matariki, children are able to make links to their wider world and experience cultural diversity, the Treaty of Waitangi, and inclusion. Matariki provides an opportunity for us all to explore the values of diversity, community and participation, and respect for self and others. 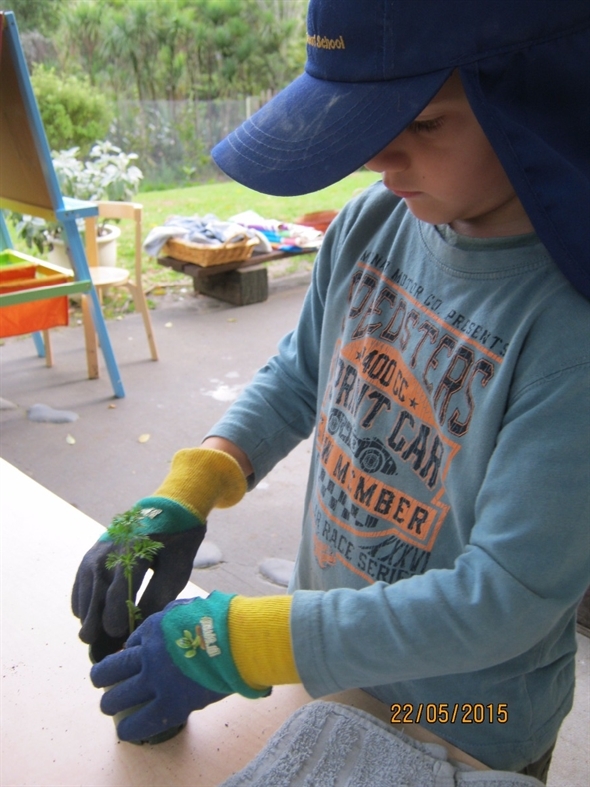 Matariki is also a useful context to promote the development of Manaakitanga and to expose our learning community to the concepts of cultural identity, place and environment, and continuity and change. 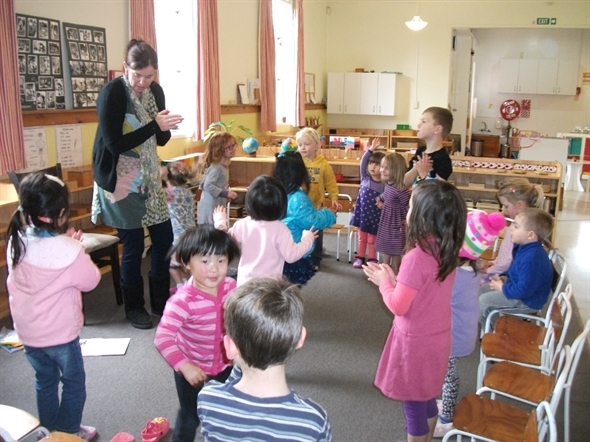 Next week we will continue to explore the value of Manaakitanga through art, song and movement. 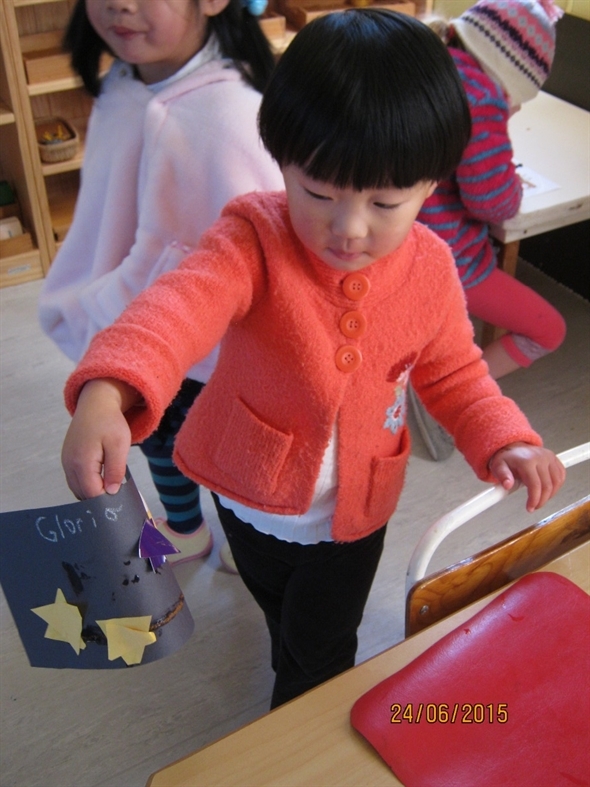 We will be talking about how to be a kind host as the children prepare for the feast. 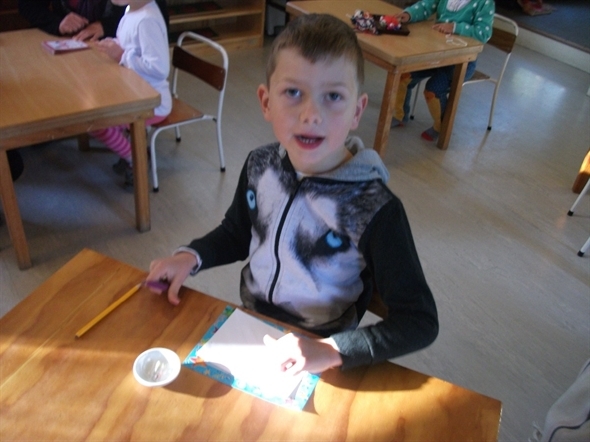 And we have prepared the environment to promote links to further learning about the phases of the moon that links to the Maori lunar calendar. Sam has had a busy June thus far! 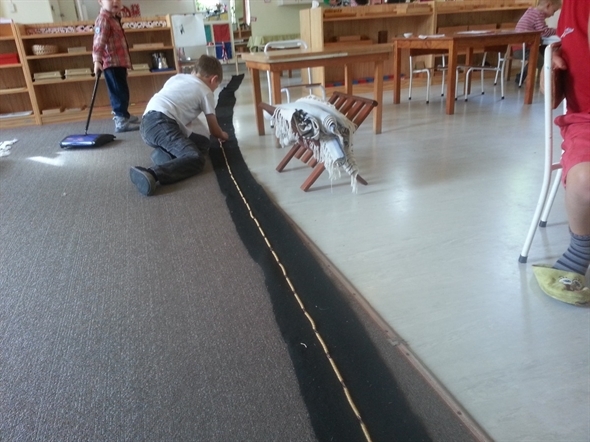 There has been exploration of land and water forms… And we have enjoyed observing Sam’s literacy explosion! 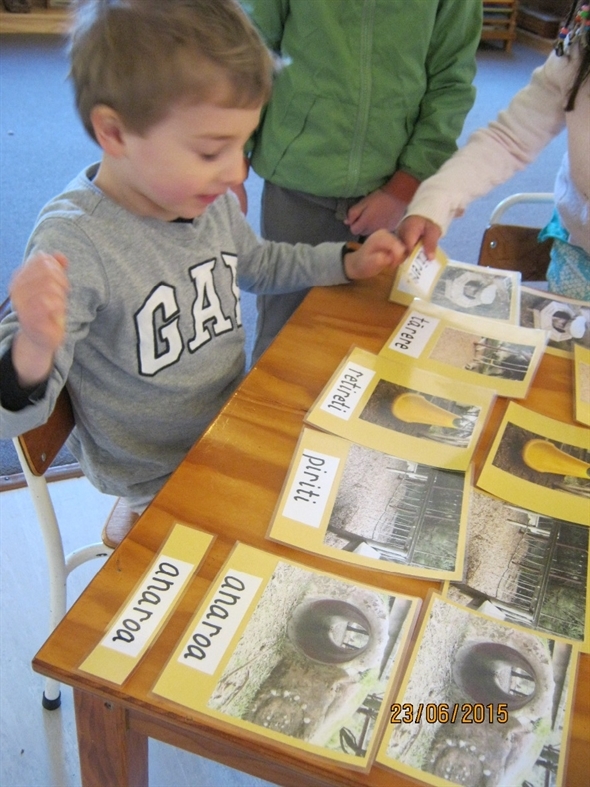 There has been book writing about his whanau (family). 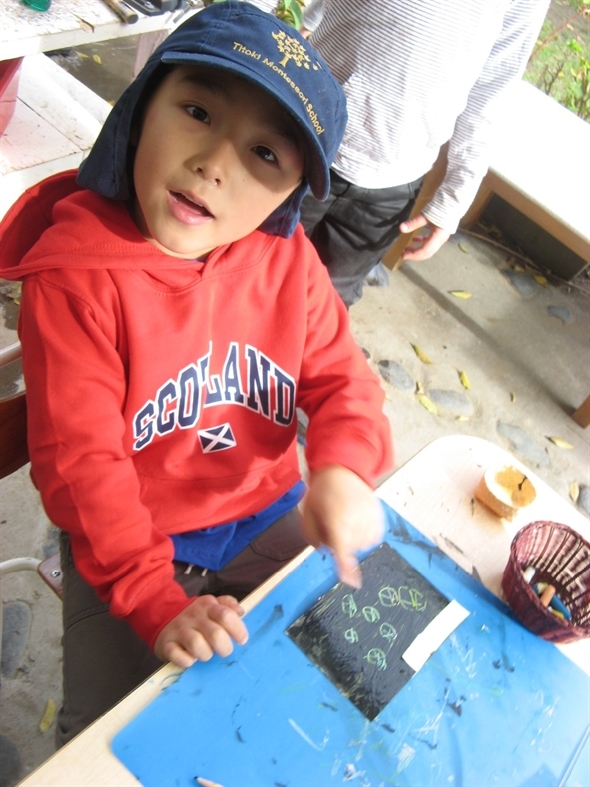 Sam was eager to share his work, which inspired further writing within the group…. 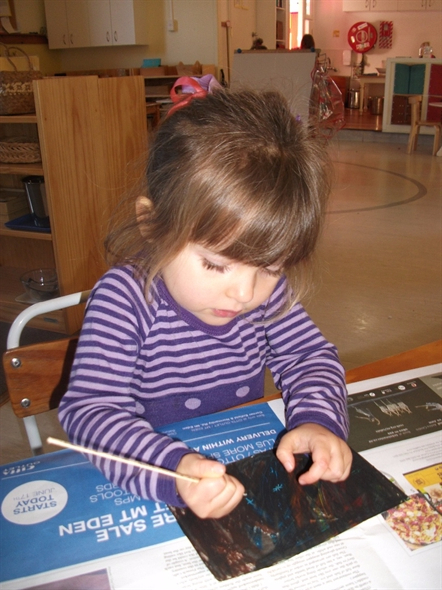 As well as letter writing to Oma and Opa. 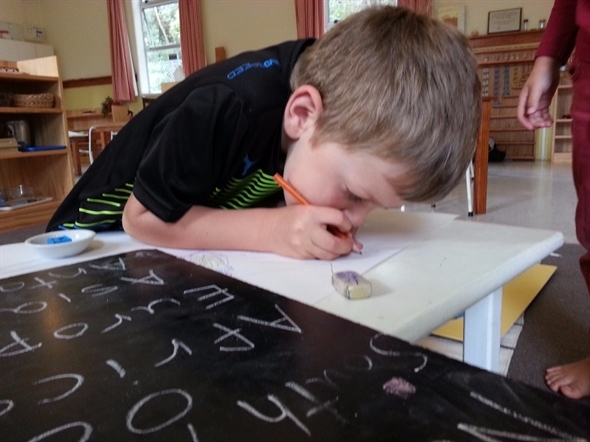 Such writing experiences highlight to our learners the real life importance of learning this skill. 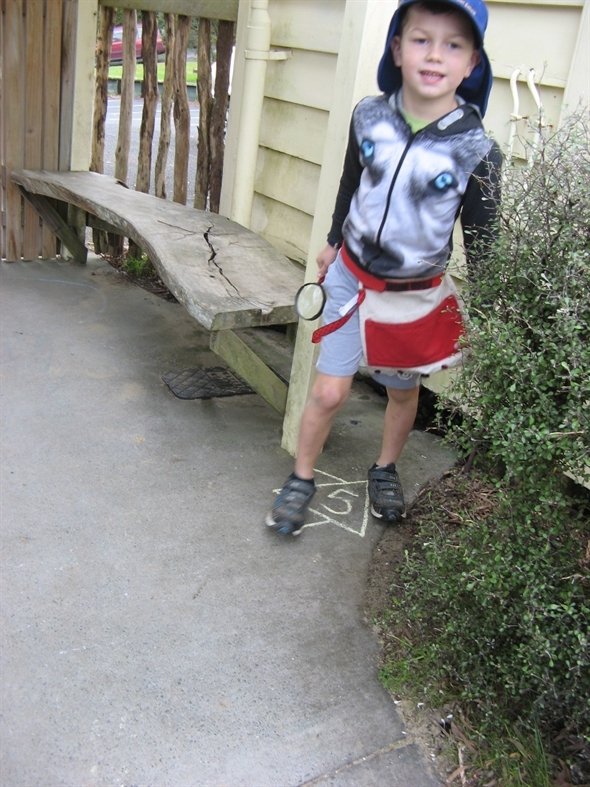 Also, Sam, as tuakana (leader) in this area helps his younger peers explore this joy. 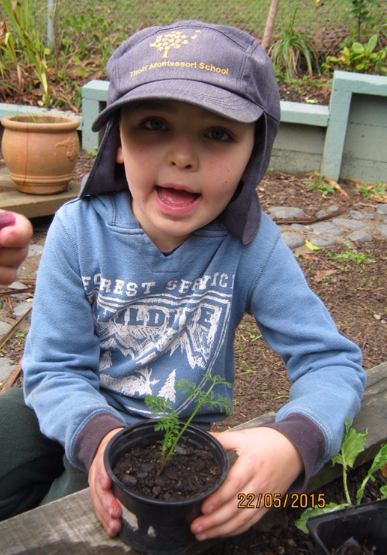 Kia ora Sam for your positive role modeling and for sharing your work! We look forward to more writing adventures over the next few weeks! Sam has been fascinated with the long bead chains for some time now. I remember his initial interest in working with the thousand chain when he visited one afternoon when Dad came to help us with the computers and he was still attending Glamorgan primary ! 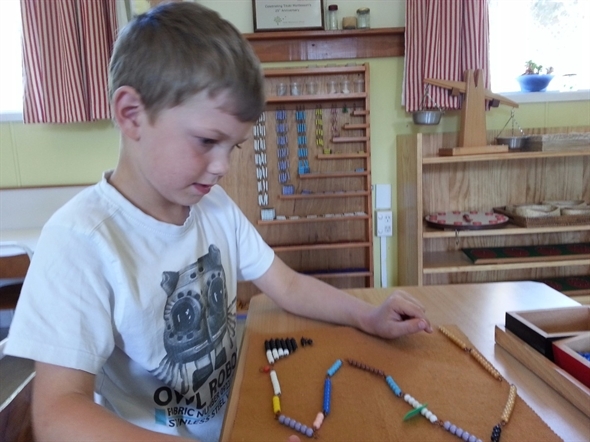 Having mastered the decimal system, the formation of numbers and working with various short bead chains including the hundred chain, he was truly ready to work with the thousand chain this term! 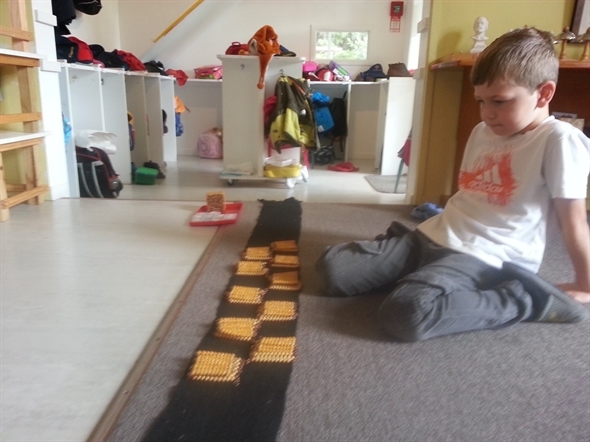 Sam took the 1000 chain, the ten hundred squares and the thousand cube to the felt runner that he had unrolled on the floor. We found that when we arranged the chain in groups of 10 tens, the hundred squares fit exactly on each of these groups. We then stacked up the 10 hundred squares and saw that they were the same size as the thousand cube ! We could see and feel that the 1000 chain was the same as 10 hundred squares; which was the same as the thousand cube! 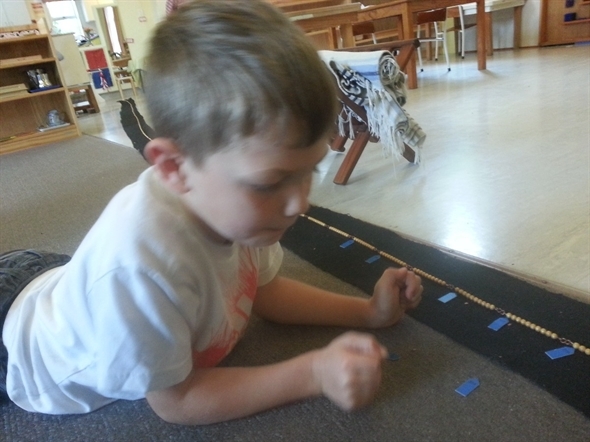 Sam then unravelled the 1000 chain into a straight line and started counting the beads, placing the correct labels to each of the first 20 beads, then for each subsequent 10 in the 1000 chain. He also placed a hundred square along the chain each time he reached a red hundred label. 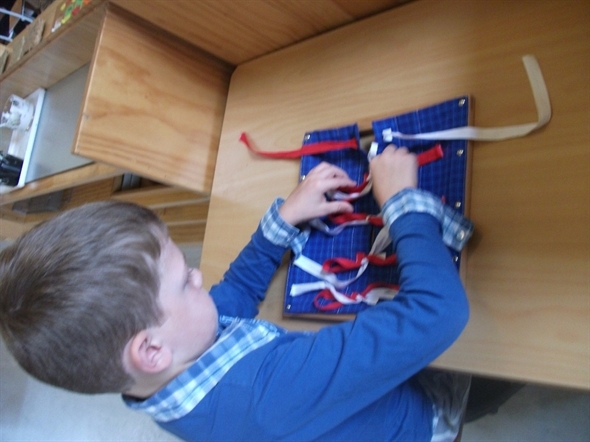 Sam, this was really hard work that needed a lot of your concentration and perseverance. When a few labels were missing, you made a new one by writing the correct number on a piece of paper, cut it into an arrow shape and placing it at the correct bead. You persisted with your task the next morning and it must have been so satisfying when you placed the last “1000” label, the last hundred square and the thousand cube at the end of the chain! 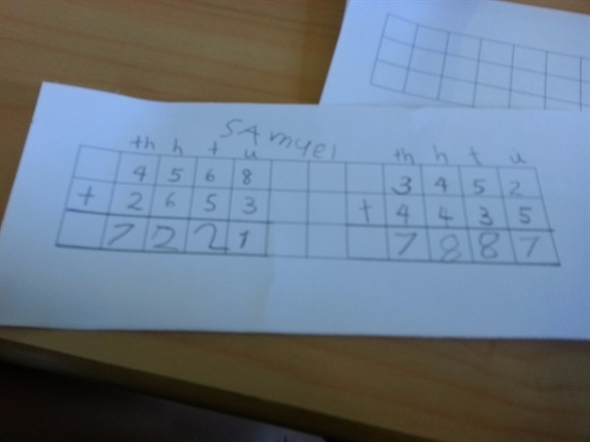 Besides linear counting, Sam is indirectly learning the square and cube of a number and to skip count by 10 with this material. 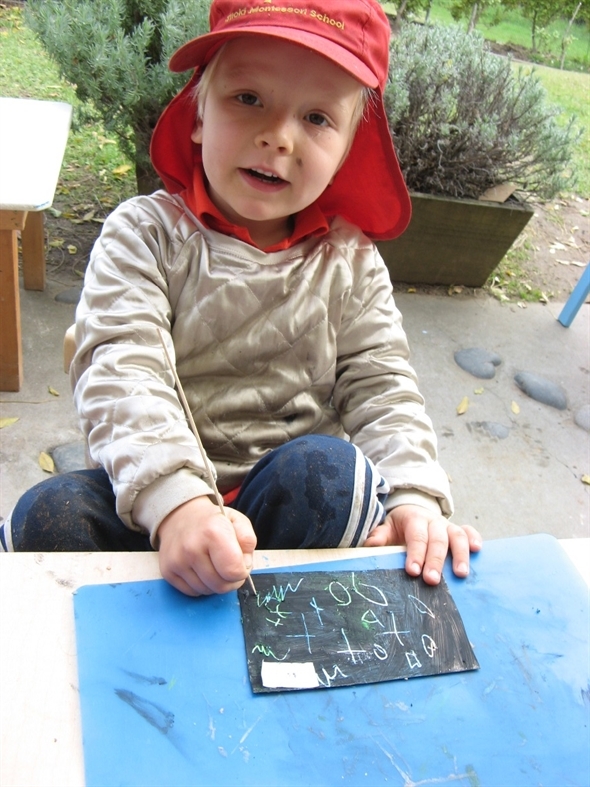 He does it in a concrete and sensorial manner as opposed to rote learning done in traditional schools. 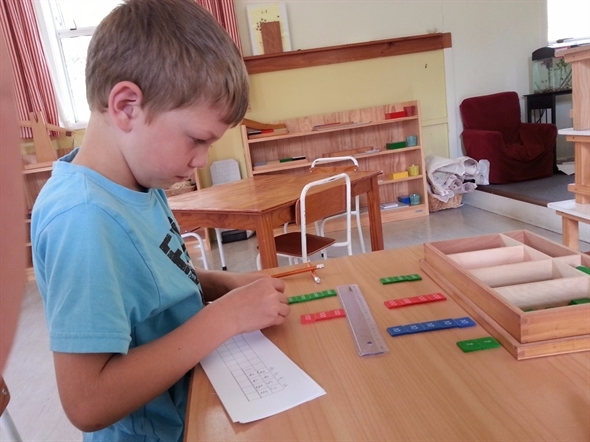 We will continue to let Sam satisfy his love for learning in the Montessori 3-6 environment; whether in the mathematics, language or other areas of the curriculum! 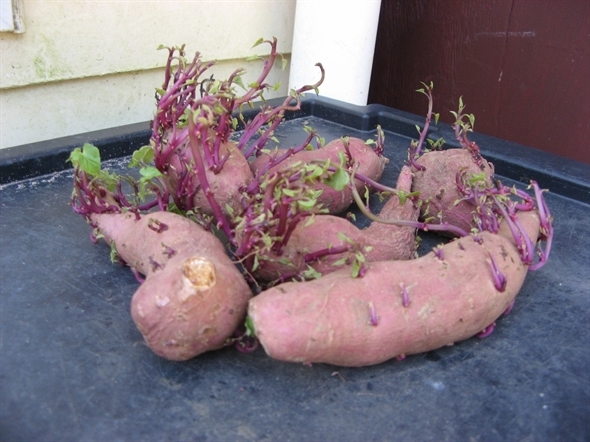 Titoki’s diary on growing carrots from recycled carrot tops. 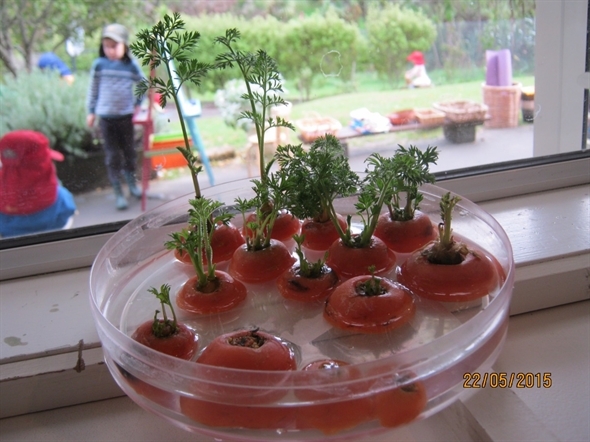 Carrot tops were put into a water dish and left by the window so that they would get lots of sunlight. 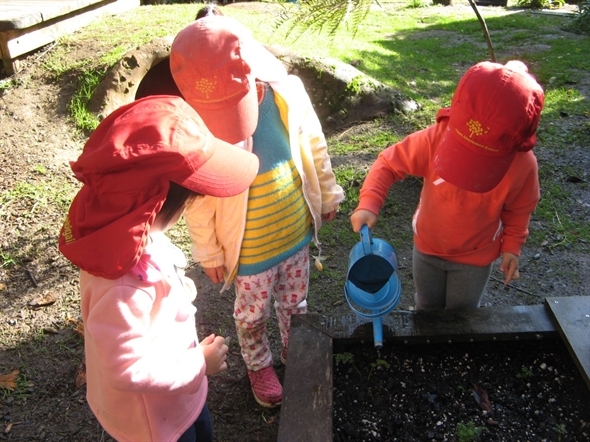 Children at Titoki know that living things need water and light to grow. 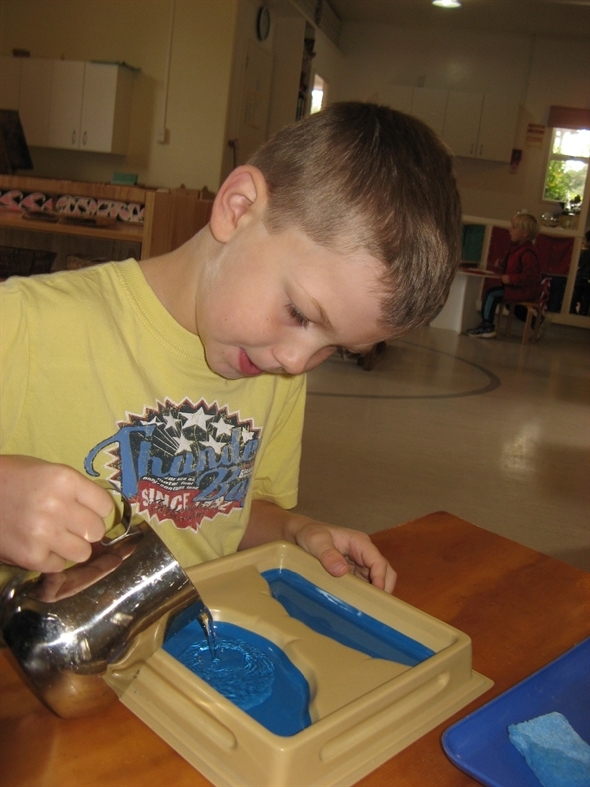 During the week, Cooper who loves preparing carrots for morning tea, kindly saved his carrot tops and added them into the water dish. After about two weeks, there were lots of young shoots and leaves and a few carrot tops even had tiny white roots growing out at the base. 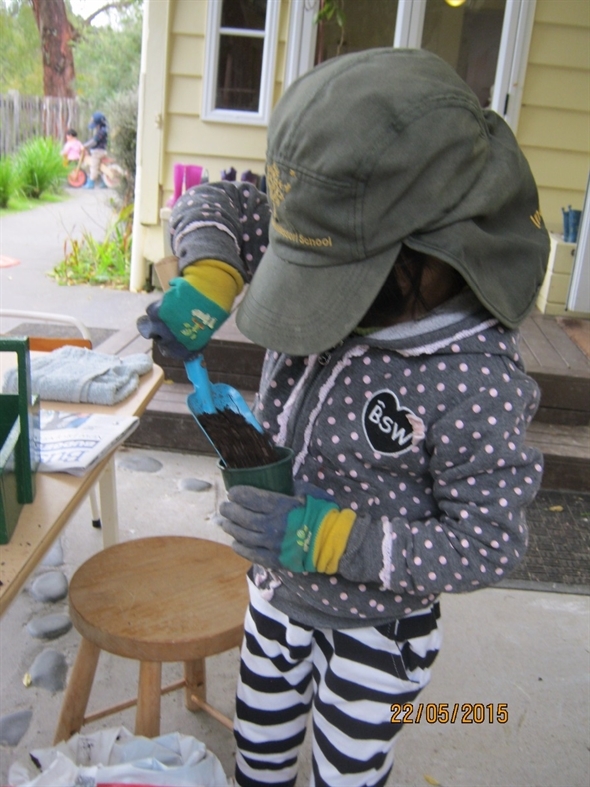 We decided that it was time to transplant the carrot tops with roots into pots. 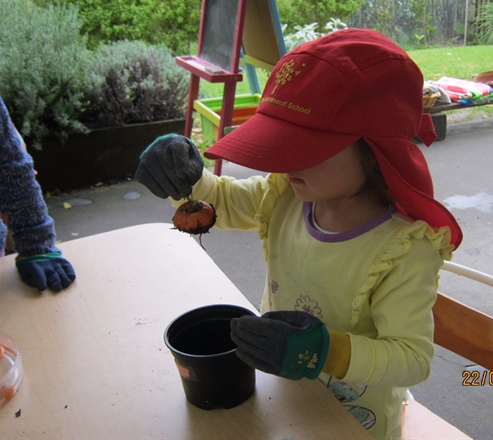 Alana, Arum, Cooper, Emily, Eva, Falco, Finn, Heath, Shilo and Torbien helped to prepare the pots and filled them with potting mix before carefully putting the carrot tops into the pots and topped them up with another scoop of potting mix. 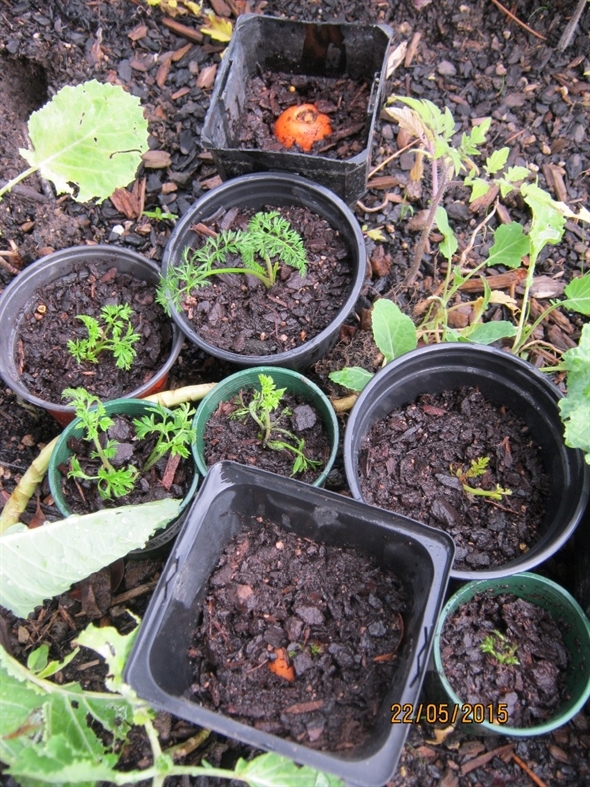 All the pots of carrots were neatly placed in the raised garden bed and watered. Now we need to buy more potting mix so that they can eventually be transplanted into the raised bed. Many thanks 😀 to Tracy, Heath’s mum, who donated two bags of potting mix and we were able to finally transplant the carrot tops into the raised garden bed. 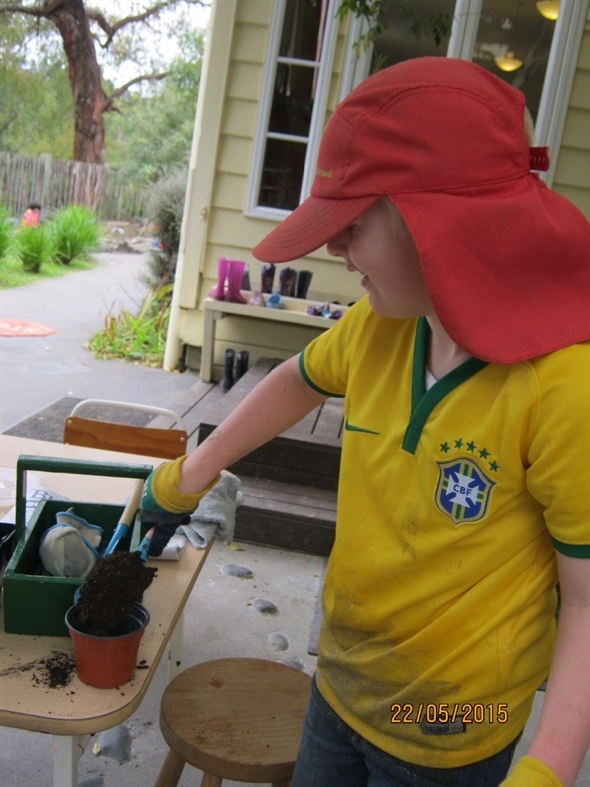 Finn, Madelief and Zach started to prepare the raised bed by removing all the dried brown leaves. Madelief remembered that dried brown leaves are great food for our worms in the worm farm and she promptly gathered all the leaves and gave our worms a treat. 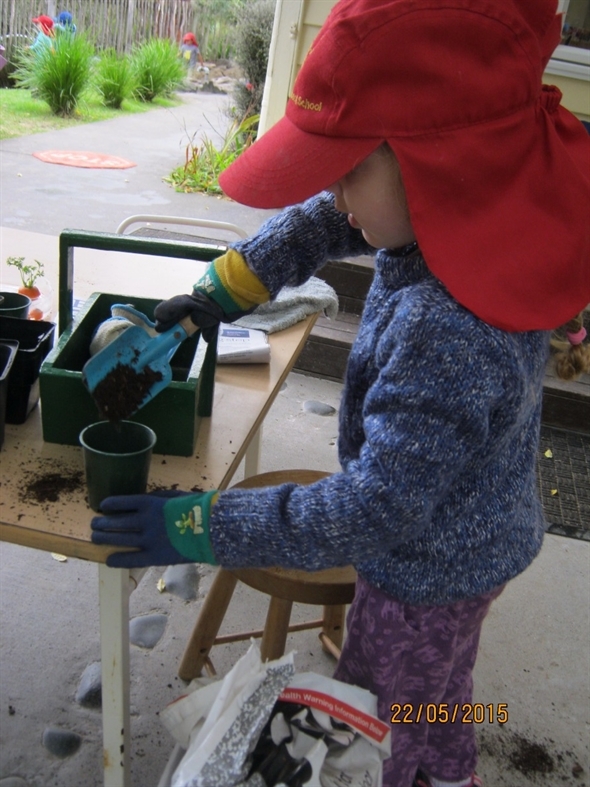 The children then went on to till the bed to loosen the hardened soil. 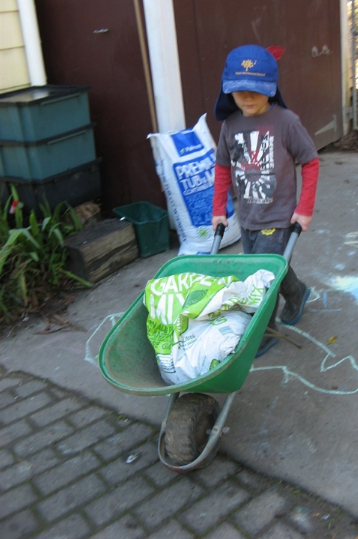 Finn and Zach volunteered to help move the half bag of potting mix and asked if they could use the wheelbarrow in the shed. Good thinking boys! 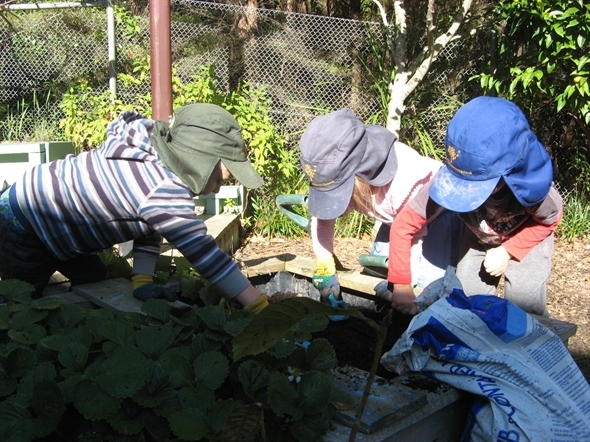 The children worked together to fill the potting mix into the raised bed. 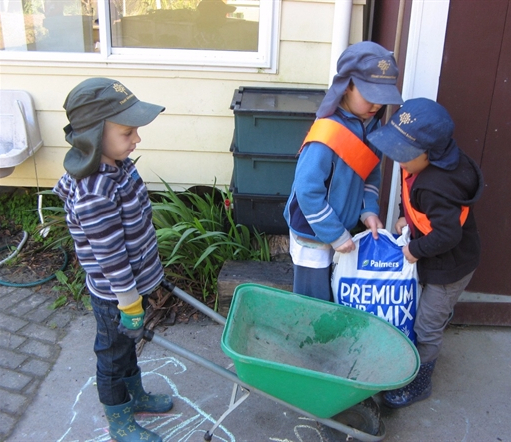 However, as Finn, Madelief and Zach tried moving the next full bag of potting mix, they found that they were not quite strong enough to lift the bag by themselves. Zach suggested that they could ask for help from the older children. Soon Madelief came back with Ethan and Torbien. With lots of muscles and hard work, the huge bag of potting mix was finally moved to the raised garden bed. Falco and Kian came along and decided to help us transfer all the potting mix into the raised bed. All the carrot tops were gently transplanted into the raised bed. 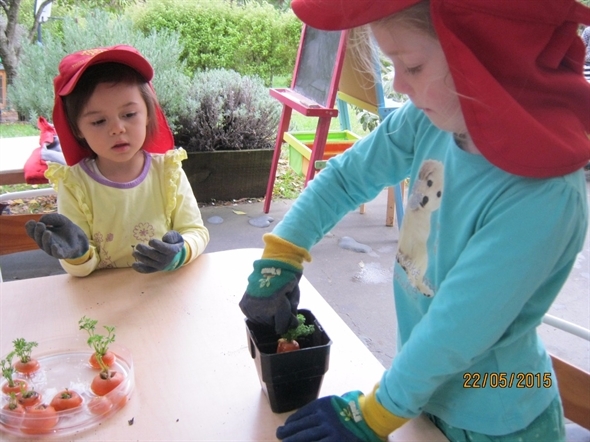 While the children were tidying up and putting all the gardening tools away, Abigail, Babette, Eva, Gloria, Inez, Ivy and Shilo happily volunteered to help water the newly planted carrot tops. A beautiful and sunny day! But we were sad that two curious Titoki youngsters could not resist pulling up the carrots to check if they were ready for harvesting 🙁 Time to call for ideas and help. A brain storming session by Sam, Madelief, Matisse and Heath. 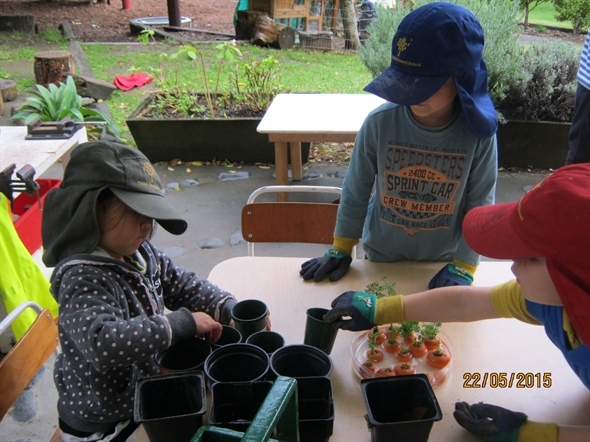 Madelief: We need to cover the carrots so the children can’t pick them again. Heath: Yeah, we should get a big cover and cover them! Sam: If we put a cover on, there will be no water and light for them to grow. I know. My daddy used some wire for the chicken coop. There are holes for the water and light to go through. The children all agreed with Sam’s idea of using chicken coop wire and we were fortunate enough to find a roll in the shed. 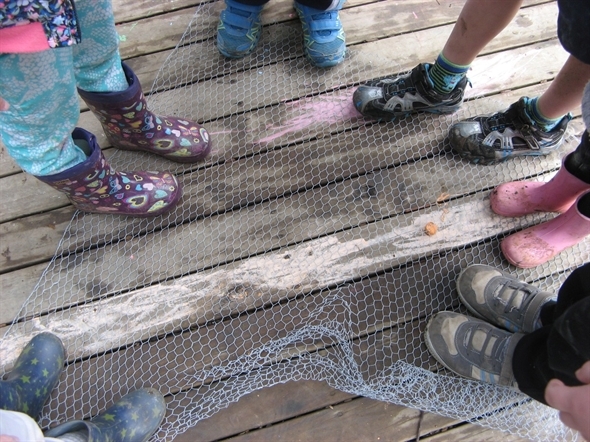 The children unrolled the wire, using both their hands and feet to unroll the wire and carefully attached it onto the screws along the sides of the raised garden bed. This brain storming session and problem solving is mirroring the wise whakatauki ‘a whero ma pango ka oti ai te mahi’ (when everyone cooperates, work is accomplished well). 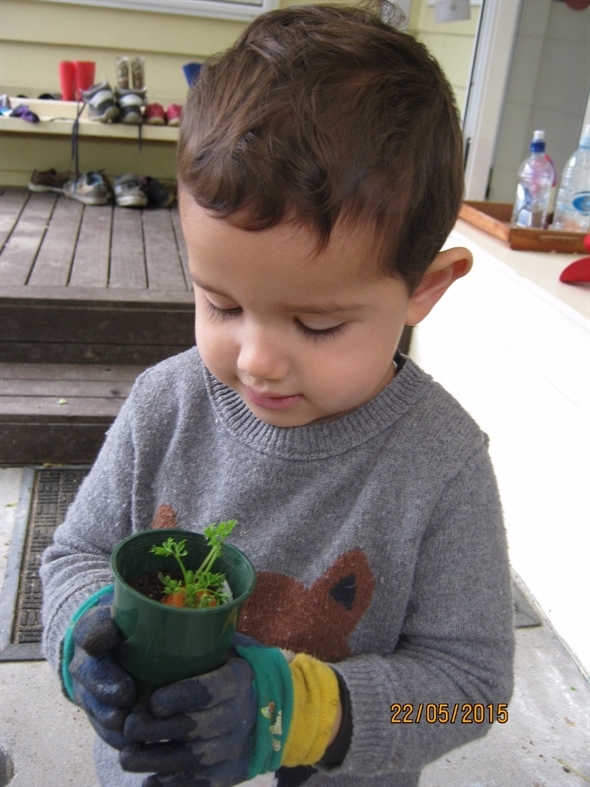 Children have learnt another method of propagating carrots besides growing them from seeds. 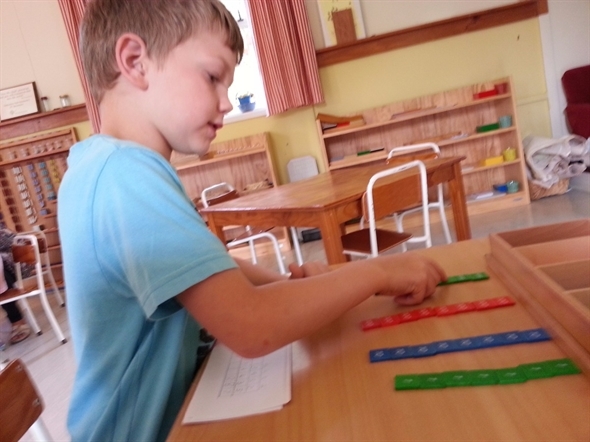 Different areas of learning such as numeracy, literacy, science and social skills have all been integrated into these past few weeks. 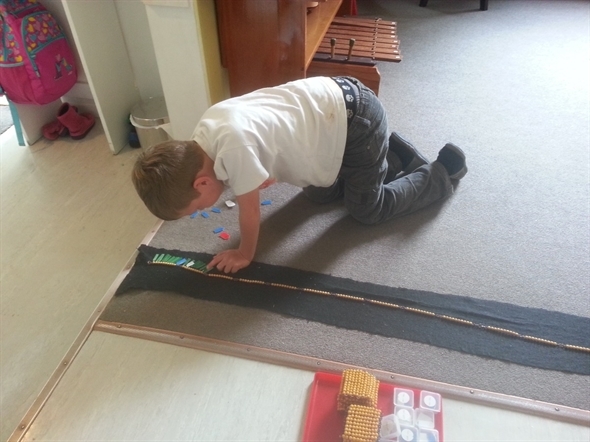 Children have been constantly challenged to work out their own theories through their personal observations and knowledge. 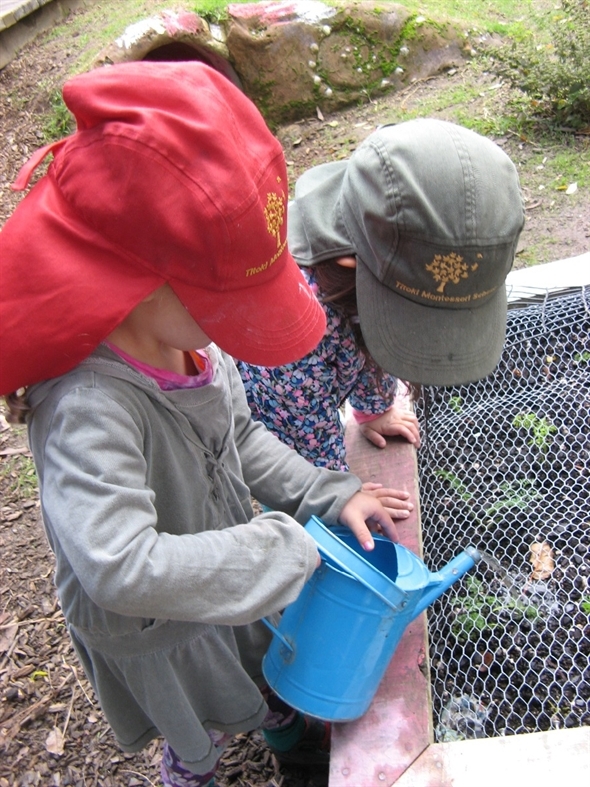 The children will continue to care for the young plants in the coming weeks and monitor their growth. 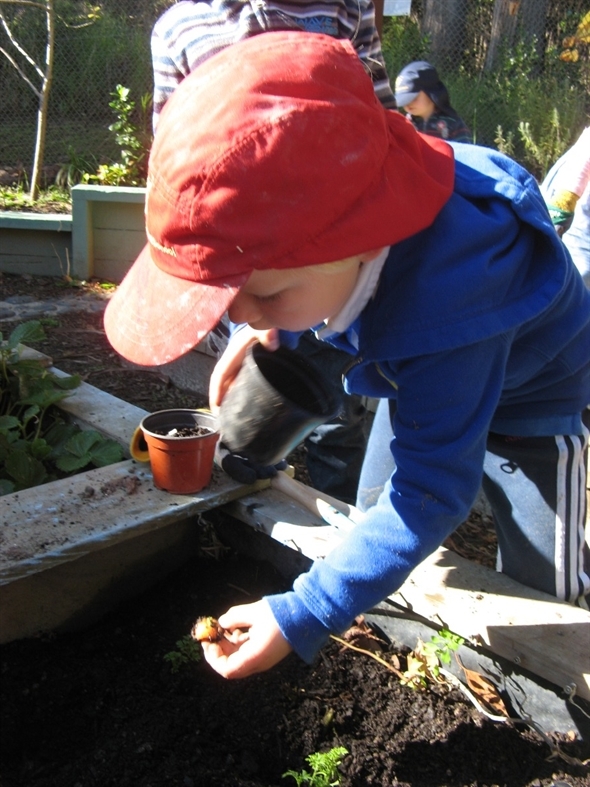 We will encourage children to explore the idea of growing other winter plants and creating their own menu when the carrots are ready for harvesting. 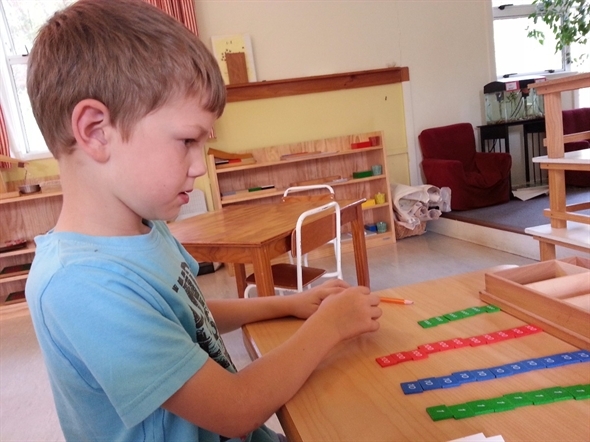 As Sam grows in his independence, we are looking for ways that we can enable him to take care of him self, gaining more control over his expanding world. 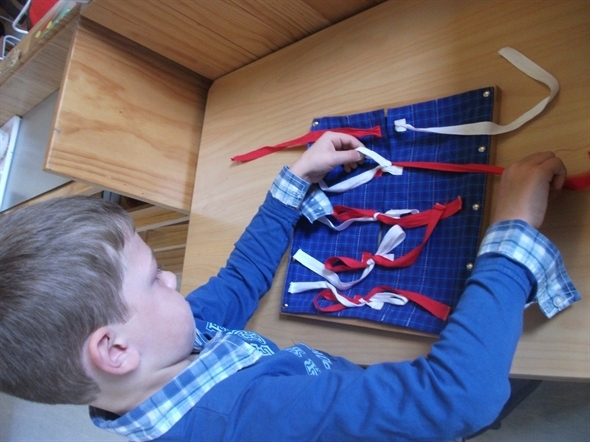 The practical life area of the curriculum addresses this need with the bow frames. 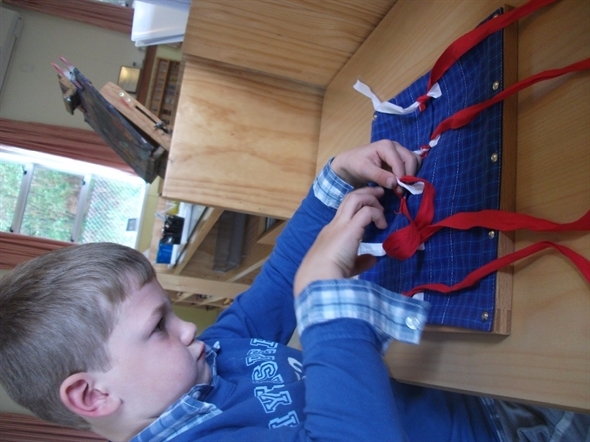 This is very ‘tricky’ and precise work for Sam’s increasingly developing voluntary motor skills…with the very long process requiring a high attention to detail. 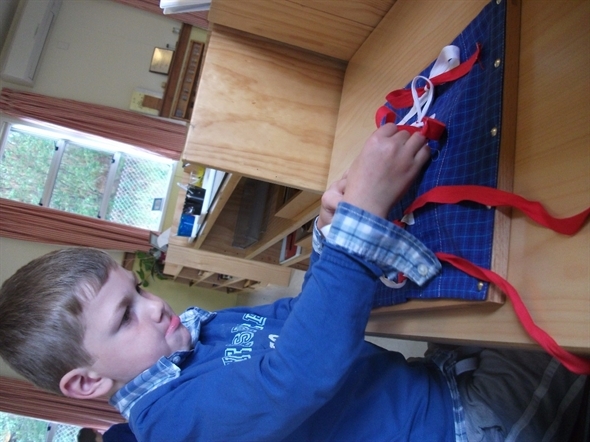 Sam is a pleasure to watch, with his growing concentration so visible as he really sinks into this problem..
As we discussed at drop off, this really is quite a skill to absorb, so we will continue to practice the bow frames, so that Sam can master this essential self-care skill. From our conversation at drop off, I understand you are supporting Sam at home to develop this skill. You may like to check out the following link so that you can see how we teach this at Titoki. He mahi nui ua a Sam, he whakaharatau koe . Its hard work Sam, keep practicing. Voluntary motors, memory recall of process, developing attention to detail and ability to care for self. 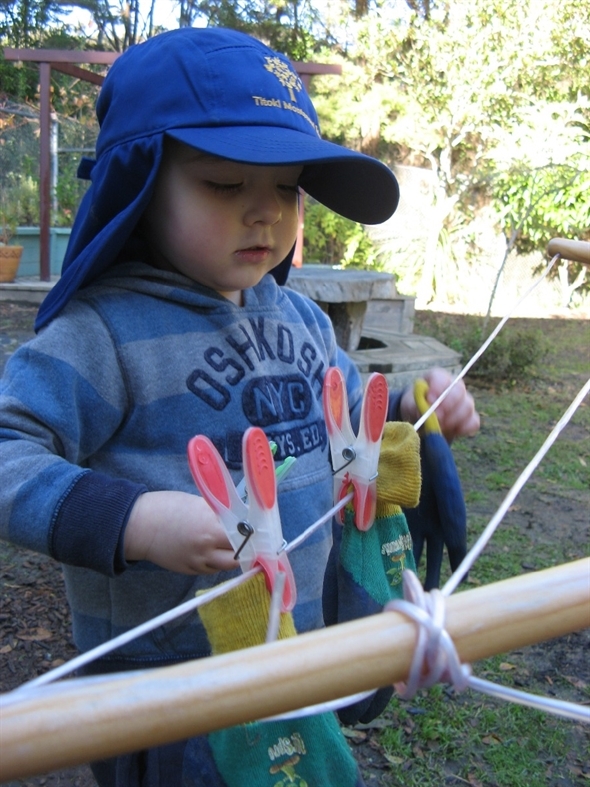 We will continue to encourage the practicing of the bow frame and with his own cool new shoes. Can also explore the lacing frame. First we give the three period lesson. Giving same time to create muscle memory for the sound, following by recognition of the sound, then himself making the sound. 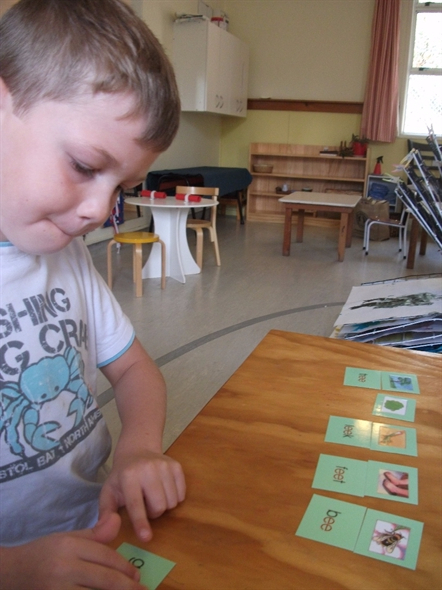 Comparing the subtle differences that one sound can make to the pair reinforces each phonogram..
Next it is important for Sam to understand that there are cases where more than one phonogram can make the same sound. The Phonogram Booklets are simply a cover with the phonogram and then pages with word examples. They also come separately as cards for sorting. 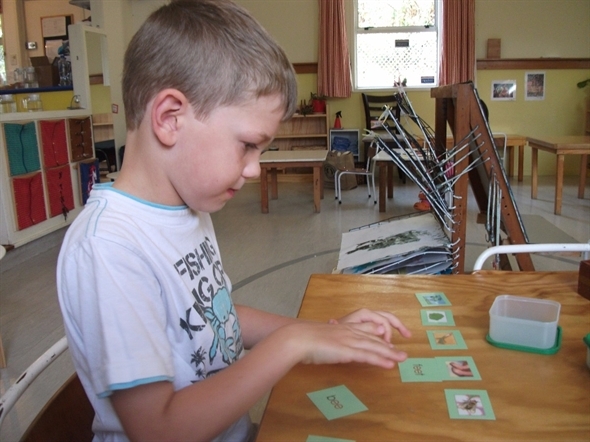 The use of pictures builds on Sam’s visual strengths, promoting self control and successful association to this learning experience. 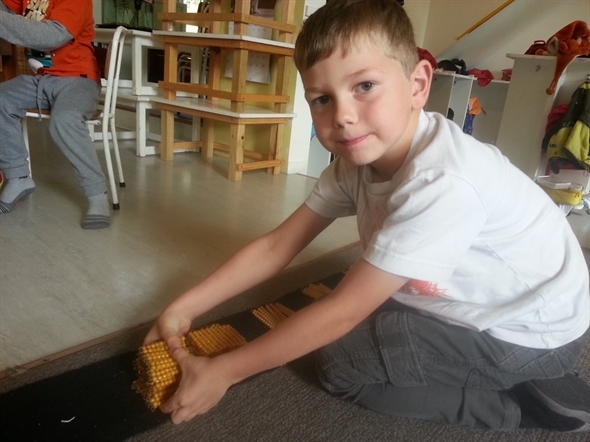 Here Sam inspires some of his younger peers with his learning, an integral part of the culture of our Montessori classroom. 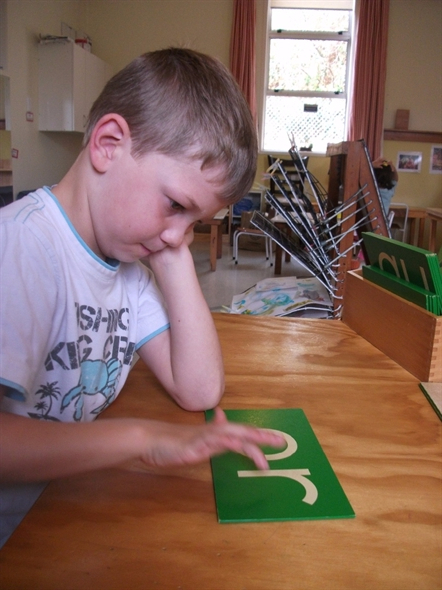 Phonetic awareness is consolidated and developed with the repeated use and practice of this material. 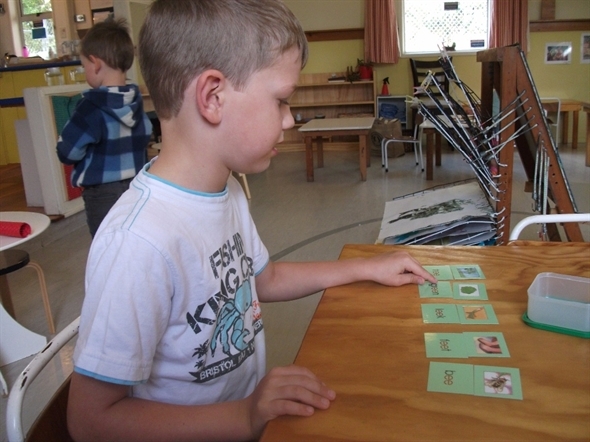 Continued development of phonograms, introducing new sounds by comparing them with known ones. Consolidating this knowledge with Sam’s interest in books, by pointing out some of these phonograms in stories, and encouraging him to use them in his writing. Sam decided to explore the stamp game this afternoon. 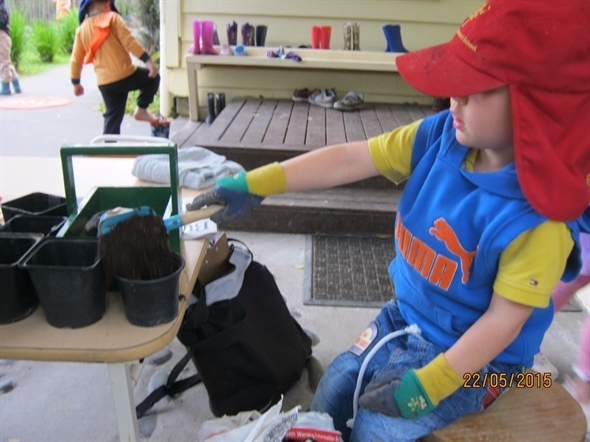 He had seen his friends do this work and was keen to get started. I wrote an addition question “3452 + 4435 = ” on a slip of paper and we got started finding out the answer. 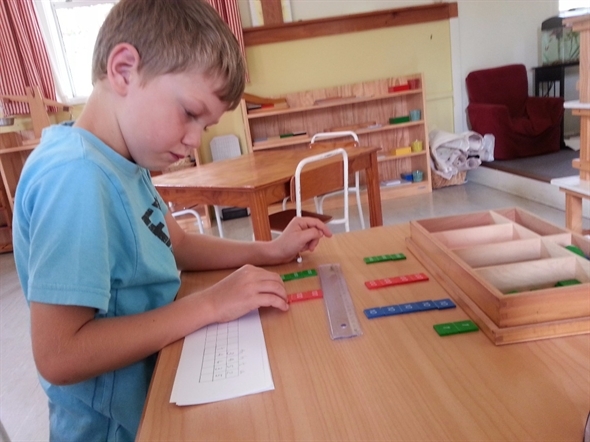 Sam had to get the correct quantities of wooden “stamps” representing the units, tens, hundreds and thousands for the first number on the question. 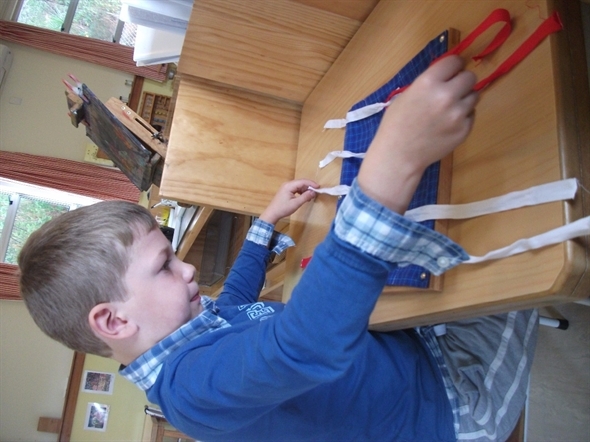 He then had to get the correct quantities for the second number and place them below the ruler. He knew the “+” sign meant he had to add the two quantities together to get the sum of the 2 numbers. 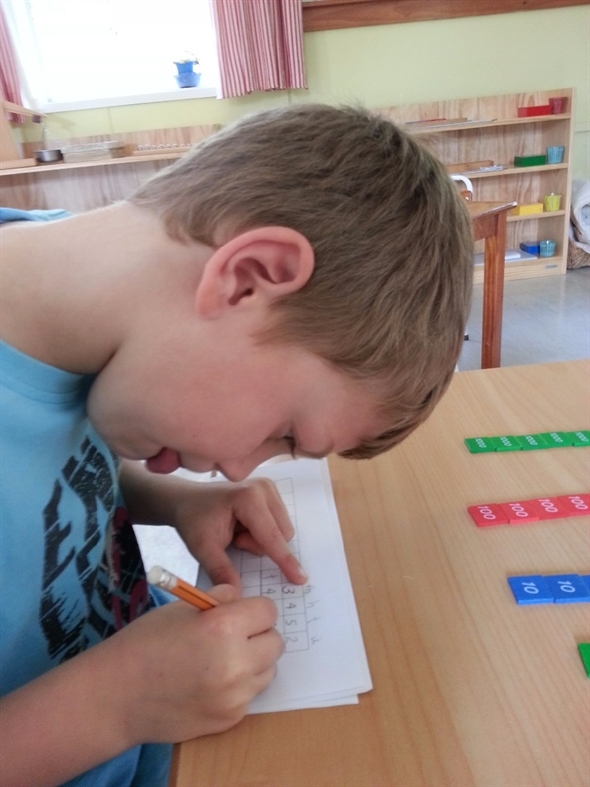 After counting the total in each category, he wrote the answers on the strip of paper. 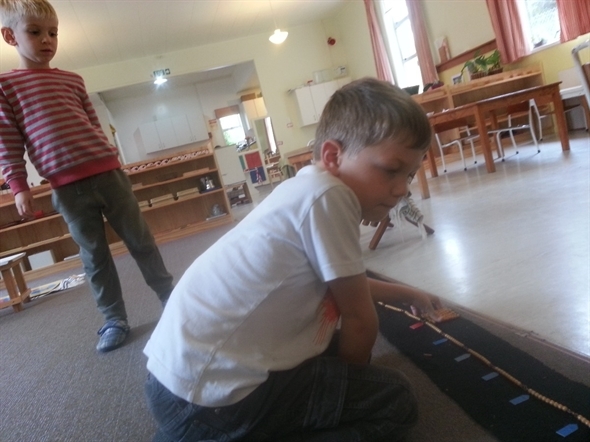 Sam continued with another question, “4568 + 2653 = ” This time he realised that he had to change ten units for 1 ten, 10 tens for 1 hundred, and 10 hundreds for 1 thousand; just like he had to when he did addition operations with his friends when they used the golden bead materials from the bank game! 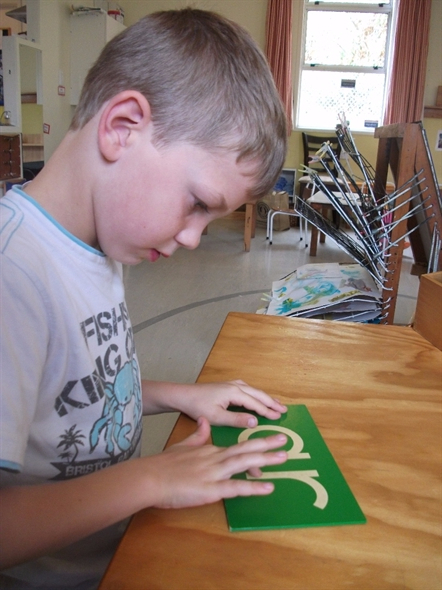 The stamp game is more symbolic as each quantity is represented by wooden stamps with the numerals representing units, tens, hundreds and thousands. 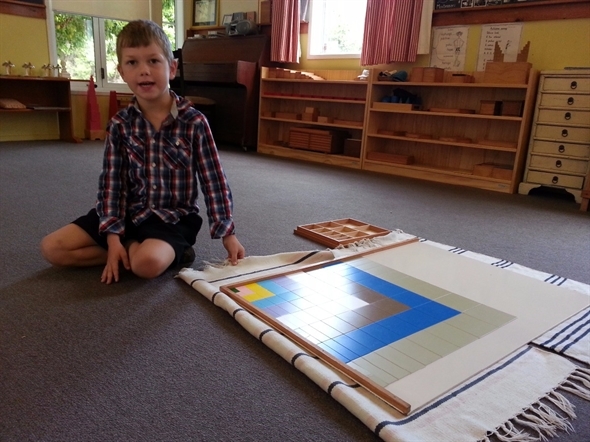 It leads Sam towards greater abstraction from the very concrete unit and ten beads, hundred squares and thousand cubes when he was first introduced to the decimal system. Sam is also reinforcing his knowledge about static and dynamic addition that he learned while playing the “bank game” with addition with his friends. 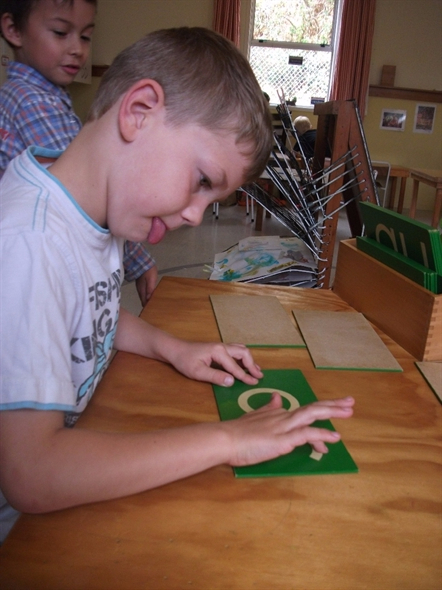 Now he can do it independently with these wooden stamps. 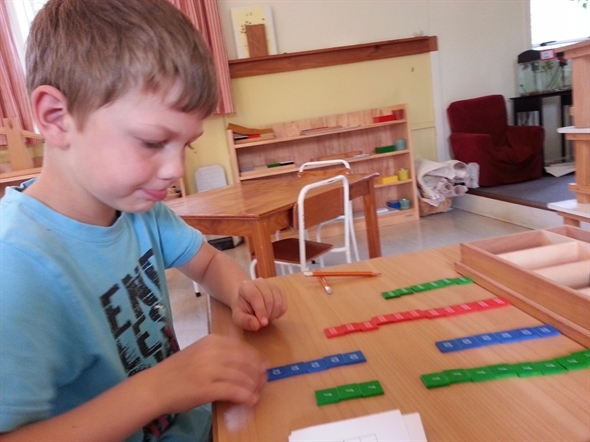 We will give Sam opportunities to repeat this game as often as he likes and introduce him to other numerical operations – subtraction, multiplication and division as Sam shows interest in them. 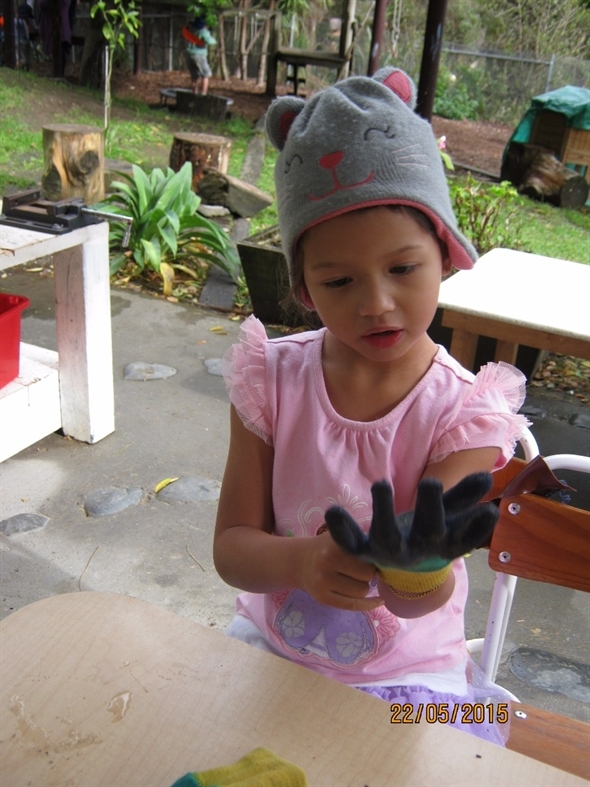 These materials are available in the Montessori primary classroom as well ! Sam, you’ve had a busy start to Term 2 ! The decanomial square is another cool material where you are indirectly preparing for the future learning of squaring and algebra; even though it’s more a puzzle work requiring lots of concentration at this stage to discriminate size, shape and colour. 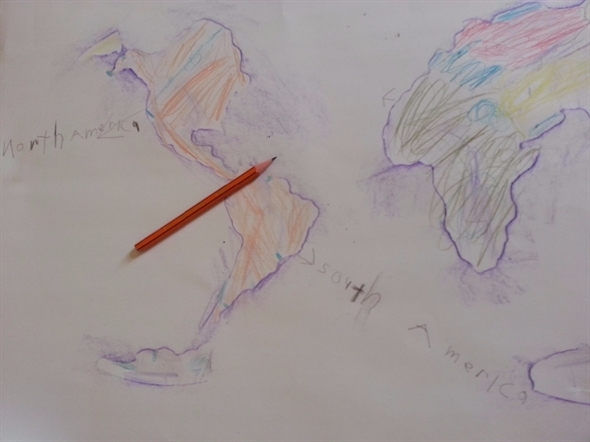 You enjoyed making your map of the world, learning the names of the continents as well as learning the parts of a volcano in the Cultural area of the classroom ! 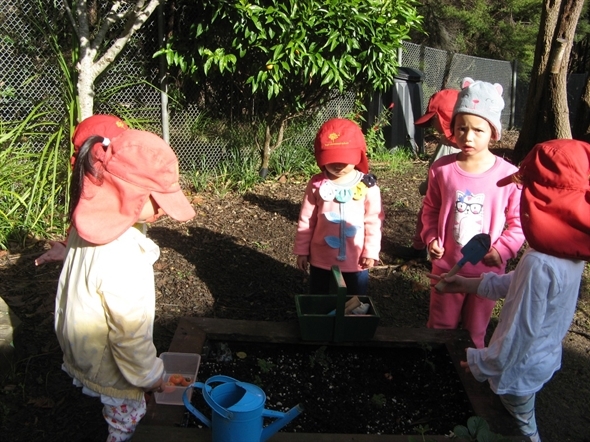 Younger children benefit from having older peers in the environment. They learn from the latter and aspire to be like them. 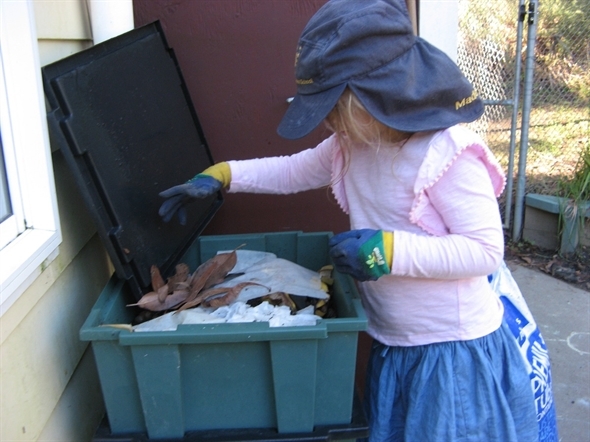 Older children get the chance to be leaders. 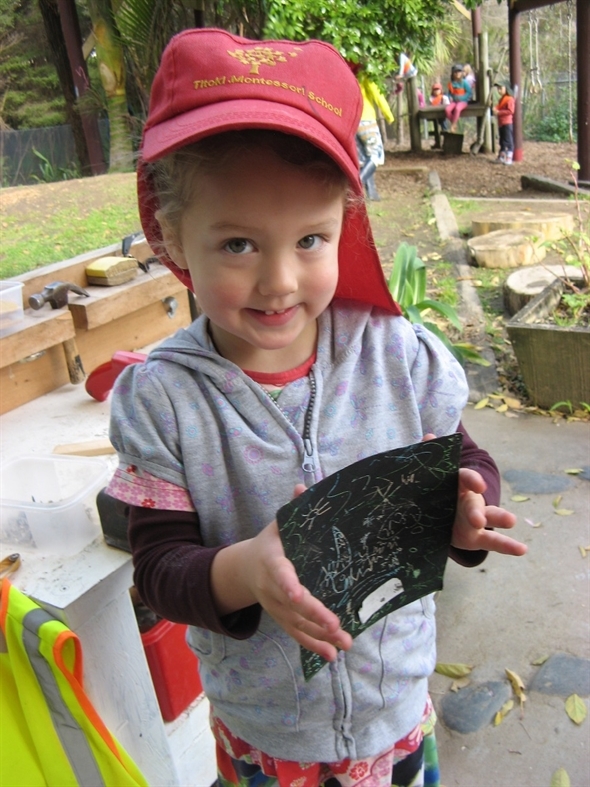 They gain confidence and a sense of responsibility as they take their younger friends under their wings ! 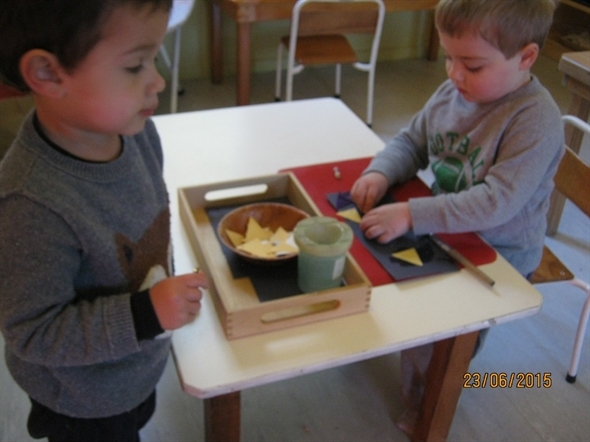 We see this trait even in our 4 year olds who start to care for the 3 year olds in their midst and show them how to roll a mat or tidy up after snack. It’s really great watching the tuakana-teina relationship that the children at Titoki exhibit. It functions as a mentoring-type relationship, where a child senior in age, position or experience works alongside a junior person in order for the junior to learn. 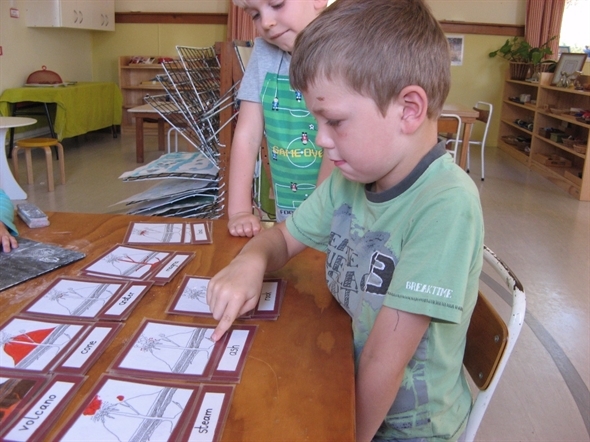 Research shows that peer-tutoring brings benefits to both the tutor and the tutee. The former’s own knowledge is reinforced as he tutors and the latter often learns better from his slightly older peer than an adult. Matisse and Ruby have been busy preparing for a puppet show for their friends. They developed characters with paper and wrote a script for their show. Today, they were ready to stage their show and got everything organised outside, including getting the audience together. No one was compelled to watch and children who wanted to continue with carpentry, athletics or the balance bike could carry on with their preferred activities. I managed to catch on video a part of their performance after Matisse started the show with “Ladies and gentlemen, boys and girls, welcome to our puppet show. There’re all sorts of puppets. And our first character’s gonna be Elsa !” Not surprisingly, the girls got a big round of applause for Elsa’s character. There were numerous characters prepared including Olaf, Rapunzel, Snow White and props like castles, towers and trees. I’m guessing the girls will be staging their shows over a few days, given the interest from their friends. 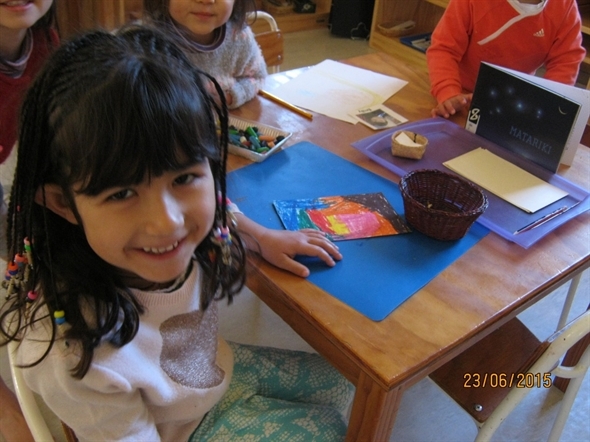 The Montessori 3-6 age group allows 5 year olds to be leaders as they independently plan and stage a show like this. 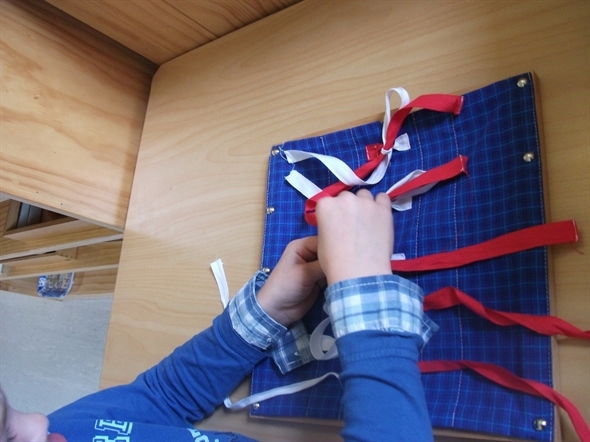 The teacher’s only input was to encourage the girls to write a script to avoid stage fright! We had no idea what they wrote but it was 2 pages full, from what we saw in Matisse’s hand. They also prepared a poster a week ago to promote their show, inviting “only happy people” and “no sad people” to the show 🙂. What a treat for the children and teachers to be entertained by passionate performers! We hope you enjoy watching the clip to appreciate how the mixed age group brings benefits to both older and younger children!